Özellikle 1970’ li yıllardan bu yana, hem akademisyenler hem de uygulamacılar arasında yönetim ve örgüt açısından kültürün ne anlama geldiği, üzerinde çokça tartışılan konulardan biri durumuna gelmiştir. Bu çalışmada örgüt, kültürel bakış açısıyla ele alınarak, antropolojideki kültür kuramının kökenleri ile örgüt kuramı arasındaki etkileşim ve ortaya çıkan araştırma alanları özetlenmeye çalışılmaktadır. Kültür kuramının sınırlarını ve gücünü ortaya koyan bu tematik çerçeve, örgüt ve kültür kuramlarının kesişim noktalarını ve beraberinde farklı kuramlara dayalı farklı araştırma stratejilerini sunmaktadır. Çalışmada, örgüt kültürü çalışmalarında yöntem tartışması üzerinde durularak, farklı yönetim ve örgüt kuramlarının benimsedikleri farklı araştırma stratejileri ele alınmaktadır. Adler, N. J. (1983) “A Typology of Management Studies Involving Culture”, Journal of International Business Studies, 14(2), ss. 29 47. Aktouf, O. (1992) “Management and Theories of Organizations in The 1990s: Toward A Critical Radical Humanism?”, Academy of Management Review, 17(3), ss. 407 431. Alvesson, M. (1990) “On Popularity of Organizational Culture”, Acta Sociologica, 33(1), ss. 31 49. Alvesson, M. (1993), Cultural Perspectives on Organizations, Cambridge University Press, USA. Astley, G. W. (1985) “Administrative Science as Socially Constructed Truth”, Administrative Science Quarterly, 30, ss. 497 513. Astley, G. W. ve Van de Ven, A. H. (1983) “Central Perspectives and Debates in Organizatinal Theory”, Administrative Science Quarterly, 28, ss. 245 273. Barley, S. R. (1983) “Semiotics and The Study of Occupational and Organizational Cultures” Administrative Science Quarterly, 28(2), ss. 393 413. Bartlett, C. A. ve Ghoshal, S. (1998), Managing Across Borders: The Transnational Solution, MA: Harvard Business Scholl Press, Boston. Benedict, R. (2000), Kültür Örüntüleri, M. Topal (çev. ), Üçüncü Baskı, Öteki Yayınevi, Ankara. Broms, H. ve Ghamberg, H. (1983) “Communication to Self in Organizations and Cultures”, Administrative Science Quarterly, 28(3), ss. 482 495. Burrell, G. ve Morgan, G. (1979) Sociological Paradigms and Organizational Analysis, Heinemann, London. Burt, R. S., Gabbay, S. M., Holt, G. ve Moran, P. (1994) “Contingent Organization As A Network Theory: The Culture Performance Contingency Function”, Acta Sociologica, 37(4), ss. 345 370. Carroll, D. T. (1983) “A Disappointing Search for Excellence”, Harvard Business Review, 61(6), ss. 78 88. Cartwright, S. ve Cooper, C. L. (1993) “The Role of Culture Compatibility in Successful Organizational Marriage”, Academy of Management Executive, 7(2), ss. 57 70. Child, J. (1997) “Strategic Choice in The Analysis of Action, Structure, Organizations and Environment: Retrospectand Prospect”, Organization Studies, 18(1), ss. 43 76. Child, J. ve Tayeb, M. (82/83) “Theoretical Perspectives in Cross-National Organizational Research”, International Studies of Management & Organization, 12(4), ss. 23 70. Conrad, C. (1985) “Review of Peters and Austin’ s (1985) Book – A Passion for Excellence: The Leadership Difference”, Administrative Science Quarterly, 30(3), ss. 426 428. Damanpour, F. ve Evan, W. M. (1984) “Organizational Innovation and Performance: The Problem of ‘Organizatonal Lag’”, Administrative Science Quarterly, 29, ss. 392 409. 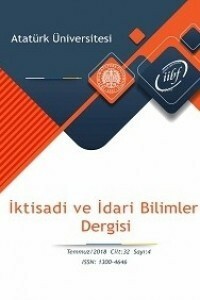 Danışman, A. ve Özgen, H. (2005) “Örgüt Kültürü Çalışmalarında Yöntem Tartışması: Niteliksel-Niceliksel Yöntem İkileminde Niceliksel Ölçümler ve Bir Ölçek Önerisi”, Yönetim Araştırmaları Dergisi, Basımda, 3(1), 55s. Davey, K. M. ve Symon, G. (2001), “Recent Approaches to The Qualitative Analysis of Organiational Culture”, The Organizational Handbook of Organizational Culture and Climate, C. L. Cooper, S. Cartwright ve P. C. Earley (der. ), John Wiley & Sons, England, ss. 123 142. Deal, T. ve Kennedy, A. A. (1982), Corporate Cultures The Rites and Rituals of Corporate Life, Addison-Wesley Publishing Company Inc., Canada. Denison, D. R. (1990), Corporate Culture and Organizational Efectiveness, John Wiley & Sons, Canada. Denison, D. R. (1996) “What is The Difference Between Organizational Culture and Organizational Climate? A Native’ s Point of View on A Decade of Paradigm Wars”, Academy of Management Review, 21(3), ss. 619 654. Erez, M. (1990), “Toward a Model of Cross-cultural Industrial and Organizational Psychology”, Handbook of Industrial and Organizational Psychology, H. C. Triandis, M. D. Dunnette ve L. M. Hough (der. ), Palo Alto, Consulting Psychologists Press, Inc., Calefornia, ss. 559 607. Fedor, K. J. ve Werther, W. B. (1995) “Making Sense of Cultural Factors in International Alliances”, Organization Studies, 23(4), ss. 33 48. Freeman, F. H. (1985) Books that Mean Business: The Management Bestsellers”, Academy of Management Review, 10(2), ss. 345 350. Gordon, G. G. ve DiTomaso, N. (1992) “Predicting Corporate Performance From Oranizational Culture”, Journal of Management Studies, 29(6), ss. 783 798. Gregory, K. L. (1983) “Native-:View Paradigms: Multiple Cultures and Culture Conflicts in Organizations”, Administrative Science Quarterly, 28, ss. 359 376. Haris, P. R. ve Moran, R. H. (1987), Managing Cultural Differences, İkinci Baskı, Gulf Publishing, Houston. Harrison, R. J. ve Carroll, G. R. (1991) “Keeping The Faith: A Model of Cultural Transmission in Formal Organizations”, Administrative Science Quarterly, 36(4), ss. 552 582. Hitt, M. A. ve Ireland, R. D. (1987) “Peters and Waterman Revisited: The Unended Quest for Excellence”, Academy of Management Executive, 1(2), ss. 91 98. Hofstede, G. (1980), Culture' s Consequences, Newbury Park, London, 1980. Hofstede, G. (1991), Cultures and Organizations, McGraw-Hill, London. Hofstede, G. (1998) “Identifying Organizational Subcultures: An Empirical Approach”, Journal of Management Studies, 35(1), ss. 1 12. Hofstede, G., Neuijen, B., Ohayv, D. D. Ve Sanders, G. (1990) “Measuring Organizational Cultures: A Qualitative and Quantitative Study Across Twenty Cases”, Administrative Science Quarterly, 35, ss. 286 316. Kotter, J. P. ve Heskett, J. L. (1992), Corporate Culture and Performance, The Free Press, Canada. Kuhn, T. S. (1970), The Structure of Scientific Revolutions, İkinci Baskı, University of Chicago Press, Chicago. Lundberg, C. C. (2001), “Working with Cultures in Organizations: A Social Rule Perspective”, C. L. Cooper, S. Cartwright ve P. C. Earley (der. ), The Organizational Handbook of Organizational Culture and Climate, John Wiley & Sons, England, ss. 325 345. Martin, J. (1992), Culture in Organizations Three Perspectives, Oxford University Press, New York. Martin, J. ve Siehl, C. (1983) “Organizational Culture and Counterculture: An Uneasy Symbiosis”, Organizational Dynamics, 12(2), ss. 52 64. Martin, J., Feldman, M. S., Hatch, M. J. ve Sitkin, S. B. (1983) “The Uniqueness Paradox in Organizational Stories”, Administrative Science Quarterly, 28(3), ss. 438 453. Meyerson, D. ve Martin, J. (1987), “Culture Change: An Integration of Three Different Views”, Journal of Management Studies, 24(6), ss.623 647. Mitchell, T. R. (1985) “In Search of Excellence vs. The 100 Best Companies to Work for in America: A Question of Perspective and Values”, Academy of Management Review, 10(2), ss. 350 355. Mitroff, I. I. ve Mohrman, S. A. (1987) “The Slack is Gone: How The United States Lost its Competetive Edge in The World Economy”, Academy of Management Executive, 1(1), ss. 65 70. Morgan, G. (1980) “Paradigms, Metaphors and Puzzle Solving in Organizational Theory”, Administrative Science Quarterly, 25, ss. 605 622. Morgan, G. ve Smircich, L. (1980) “The Case for Qualitative Research”, Academy of Management Review, 5(4), ss. 491 500. O’Reilly, C. (1989) “Corporations, Culture and Commitment: Motivation and Social Control in Organizations”, California Management Review, 31(4), ss. 9 25. Ouchi, W. G. ve Jaeger, A. M. (1978) “Type Z Organization. Stability in The Midst of Mobility”, Academy of Management Review, 3(2), ss. 305 314. Özen, Ş. (2002) “Türkiye’ deki Örgütler/Yönetim Araştırmalarında Törensel Görgüncülük Sorunu”, Yönetim Araştırmaları Dergisi, 2(2), ss. 187 213. Peters, T. J. ve Waterman, R. H. (1987), Yönetme ve Yükseltme Sanatı “Mükemmeli Arayış”, Selami Sargut (çev. ), Altın Kitaplar, İstanbul. Pettigrew, A. M. (1979) “On Studying Organizational Cultures”, Administrative Science Quarterly, 24, ss. 570 581. Pothukuchi, V., Damanpour, F., Choi, J., Chen, C. C. ve Park, S. H. (2002) “National and Organizational Culture Differences and İnternational Joint Ventue Performance”, Journal of International BusinessStudies, 33(2), ss. 243 265. Riley, P. (1983) “A Structurationist Account of Political Culture”, Administrative Science Quarterly, 28, ss. 414 437. Rousseau, D. M. (1990), “Assessing Organizational Culture: The Case for Multiple Methods”, Organizational Climate and Culture, B. Schneider (der. ), CA: Jossey-Bass, Inc, San Francisco, ss. 153 192. Saffold, G. S. (1988) “Culture Traits, Strength and Organizational Performance: Moving Beyond Strong Culture”, Academy of Management Review, 13(4), ss. 546 558. Schein, E. H. (1984) “Coming to a New Awareness of Organizational Culture”, Sloan Management Review, 25(2), ss. 3 16. Schein, E. (1990) “Organizational Culture”, American Psychologist, 45(2), ss. 109-119. Schein, E. H. (1992), Organizational Culture and Leadership, İkinci Baskı, Jossey-Bass, San Francisco. Schein, E. (1996) “Culture: The Missing Concept in Organization Studies”, Administrative Science Quarterly, 41(2), ss. 22-240. Schultz, M. ve Hatch, M. J. (1996) “Living with Multiple Paradigms: The Case of Paradigm in Organizational Culture Studies”, Academy of Management Review, 21(2), ss. 529 557. Siehl, C. ve Martin, J. (1990), “Organizational Culture: A Key to Financia Performance?”, B. Schneider (der. ), Organizational Climate and Culture, CA: Jossey-Bass, Inc., San Francisco, ss. 241 281. Smircich, L. (1983) “Concepts of Clture and Organizational Analysis”, Administrative Science Quarterly, 28, ss. 339 358. Smith, K. K. ve Simmons, V. (1983) “A Rumpelstiltskin Organization: Metaphors an Metaphors in Field Research”, Administrative Science Quarterly, 28, ss. 377 392. Sorenson, J. B. (2002) “The Strength of Corporate Culture and Reability of Firm Performnce”, Administrative Science Quarterly, 47, ss. 70 91. Şişman, M. (2002), Örgütler ve Kültürler, Pegem Yayıncılık, Ankara. Trice, H. M. ve Beyer, J. M. (1993) The Cultures of Work Organizations, Prentice Hall, Englewood Cliffs, New Jersey, USA. Trompenaars, F. (1993), Riding The Waves of Culture Understanding Diversity in Global Business, Irwin Professional Publishing, London. Uygur, N. (1984), Kültür Kuramı, Remzi Kitabevi, Büyük Fikir Kitapları Dizisi: 8, İstanbul. Üsdiken, B. (1989) “Mükemmeli Arayış: On Yıl Önce. Beş Yıl Sonra”, Journal of Economics and Administrative Studies, 3(1), ss. 72 95. Van De Ven, A. H. (1983) “Review of Peters and Waterman’ s (1982) Book-In Search of Excellence”, Administrative Science Quarterly, 28(4), ss. 621 624. Van Maanen, J (1979a) “Reclaiming Qualitative Methods for Organizational Research: A Preface”, Administrative Science Quarterly, 24(4), ss. 520 526. Van Maanen, J (1979b) “The Fact of Fiction in Organizational Ethnogrphy”, Administrative Science Quarterly, 24(4), ss. 539 550. Weawer, G. R. ve Gioia, D. A. (1994) “Paradigms Lost: Incommensurability vs Structurationaist Inquiry”, Organization Studies, 15(4), ss. 565 589. Wiener, Y. (1988) “Forms of Vue Systems: A Focus on Organizational Effectiveness and Cltural Change and Maintanence”, Academy of Management Review, 13(4), ss. 534 545. Wilkins, A. L. Ve Ouchi, W. G. (1983) “Efficent Cultures: Exploring The Relatioship between Culture and Organizational Performance”, Administrative Science Quarterly, 28(3), ss. 468 481. Yıldırım, E. (2002) “Cogito Ergo Sum” dan “Vivo Ergo Sum” a Örgütsel Analiz”, Yönetim Araştırmaları Dergisi, 2(2), ss. 155 185. ISNAD İlhan, Tülay . "KÜLTÜRÜN ÖRGÜTLERDEKİ ROLÜ: BENİMSENEN TEORİK PERSPEKTİF VE YÖNTEM TARTIŞMALARINA İLİŞKİN KAVRAMSAL BİR İNCELEME". Atatürk Üniversitesi İktisadi ve İdari Bilimler Dergisi 20 / 2 (November 2010): 273-294.